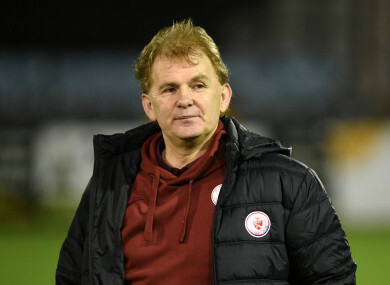 Sligo Rovers manager Liam Buckley. ROMEO PARKES’ FIFTH minute goal earned Sligo Rovers their first home win of the season, in a hard fought victory over the league’s bottom side UCD. Despite going ahead early, Rovers were under pressure for large parts of the game, and did well to cope with everything the Dubliners threw their way. UCD travelled to the north-west hoping to pick up their first victory of the season, having last week picked up their first point in 2019 thanks to a draw against St Patrick’s Athletic. Richie O’Farrell was first to test the opposition ‘keeper as he went for goal after just two minutes, but it did not trouble Mitchell Beeney in the Sligo goals. ATTENDANCE: Tonight’s official attendance is 2,103. Jamaican striker Parkes has excited the Sligo fans since signing, and he had them on their feet after five minutes when he capitalized on a defensive error from UCD, before tucking his shot away nearly past Conor Kearns in the Students’ goal. UCD went on in search of an equalizer as Republic of Ireland U21 manager Stephen Kenny looked on. The impressive O’Farrell played in Yoyo Mahdy whose effort was well saved by Beeney before Liam Scales nodded a UCD corner wide of the mark. Liam Buckley’s side could have extended their lead through Ronan Murray, but Colchester loanee Sam Warde will be kicking himself for days after missing a sitter. Kris Twardek snuck away from Mark Dignam and sent a cross right across the face of goal for Warde, who was just ahead of the ball and couldn’t organize his feet in time. Collie O’Neill’s men were arguably the better side during the first-half and they continued to pile the pressure on the hosts after the re-start, but an equalizer was proving to be elusive. Kearns did well to prevent Rovers from doubling their lead when Liam Kerrigan burst forward and spotted David Cawley free at the far post, the Mayo man could only hit his shot straight at the Dubliners’ netminder. The visitors almost got their just rewards when a corner was backheeled at goal by Kevin Coffey, but John Mahon’s brilliant interception ensured his side remained in the lead. The Bit O’Red were pouncing every time that UCD broke forward, and they almost made it 2-0 when they burst forward after a UCD attack. Cawley crosses from the right and his Mayo compatriot Ronan Murray was unmarked in front of goal, but he could not connect with the threatening ball. Dan Tobin and Gary O’Neill attempted to find an equalizer for the students, but Beeney was barely threatened. SLIGO ROVERS: Mitchell Beeney; Niall Morahan, John Dunleavy, John Mahon, Lewis Banks; Kris Twardek (Ronan Coughlan, 76), Jack Keaney, Ronan Murray, Sam Warde (David Cawley, 46), Liam Kerrigan; Romeo Parkes. UCD: Conor Kearns; Dan Tobin, Liam Scales, Josh Collins, Mark Dignam; Kevin Coffey, Richie O’Farrell, Timmy Molloy, Gary O’Neill, Jason McClelland; Yoyo Mahdy (Sean McDonald, 80). Andy Dunne joins Murray Kinsella and Ryan Bailey to discuss Joe Schmidt’s undroppables and how France might attack Ireland’s predictability in The42 Rugby Weekly. Email “Jamaican international Parkes fires Sligo past UCD as Bucko's men secure consecutive wins”. Feedback on “Jamaican international Parkes fires Sligo past UCD as Bucko's men secure consecutive wins”.